I watch conflict play out in my first-year writing class frequently. One of my students created a writing project that combined the old-but-newly-relevant topic of gun control with an invitational argument structure: here are the facts, here are the sides, now what do you think? The resulting product was a presentation that ended with class discussion. Any conversation about gun control, especially after the mass shooting in Las Vegas last November and the school shooting at Marjory Stoneman Douglas High School on Valentine’s Day, could have gone terribly wrong. This time, however, everyone asked for and received a chance to speak, even students who usually stay silent, and they supported each other when there was disagreement. The energy was high and mostly positive. We let the discussion run long enough for the quieter, more thoughtful students to have a chance to listen, think, and respond. At the end of class, students who had heavily disagreed with one another made sure to resolve conflicts and smooth ruffled feathers before leaving. My students are often so afraid to disagree, but they have so much to say. Students need to gain confidence in arguing, which is different, I think, from becoming comfortable with conflict. I was not in the front of the room, running or controlling everything. When students give presentations, I find a seat in the middle of the class. So, I was part of the audience–and the conversation—just like the rest of the students. Create Community in the Classroom . . . Throughout the semester, I frequently have students group and re-group to complete tasks and share ideas. Most of them had talked to one another a few times by the time this conversation took place, and they knew what to expect from their classmates: their political viewpoints, their argumentation style, their experiences that might inform the conversation. I remind them constantly that they are in a room with allies, people who are more like them than not, and who are interested in what they think and say. In this conversation, I did not let them fall back on “There is a happy medium.” There is no agreeing to disagree. It’s okay to acknowledge that there are multiple ways to address and think about the same issue without having to find consensus. We had all completed a five-minute freewriting activity earlier in the semester about gun control. Their responses remained private unless they chose to share, but everyone had already spent at least a few minutes thinking about the topic. They were ready to enter the conversation on this day. A more hierarchical and traditional classroom discussion approach would have kept the students in their places, to be sure: away from conflict, directed by a teacher’s intentions instead of motivated by classmates’ interest, and, sadly, politely silent instead of confidently vocal. The skills that students develop by embracing argument are applicable both in and outside of the classroom. College, while it is a sheltered and safe environment in some ways, ultimately is what prepares these students for the real world, a world full of conflict and difficult conversations. 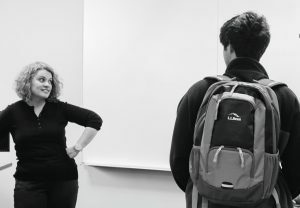 NCTE member Paula Patch is a Senior Lecturer in English at Elon University, where she coordinates the first-year writing program and has taught composition and grammar courses since 2006. She would like to thank the Secondary English Education majors in her composition theory class in Fall 2017 for giving her feedback on this post. You can follow her on Twitter via @profpatch.